The prototype Yakovlev Yak-11 flew on 10 November 1945 entering service with the Warsaw Pact countries the following year, it's airframe was based on the famous Russian Yak-3 fighter of WW2, and although primarily designed as a training aircraft, the Yak-11 retained a nose mounted machine gun and bomb racks facilitating both weapons training and ground attack capability should the "Cold War" ever turn "Hot", NATO gave the Yak 11 the codename "Moose". Records show that 3,859 aircraft had been produced by 1956 when production ceased in favour of more modern designs with front nose-wheels, the Yak-11 remained the main military training aircraft of the Warsaw Pact countries until 1962. This picture of Yakovlev Yak 11 is Copyright © June 2014 Siteseen Ltd. We only authorise non-commercial picture use and particularly encourage their use for educational purposes. This Yakovlev Yak 11 picture is not in the Public Domain. 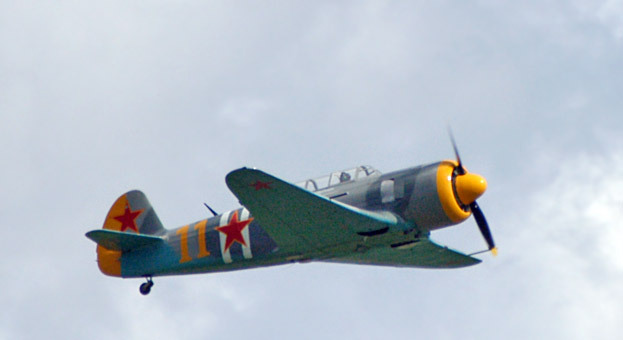 3) Use of this Yakovlev Yak 11 picture, or any of our pictures on websites re-distributing copyright free material is strictly prohibited.